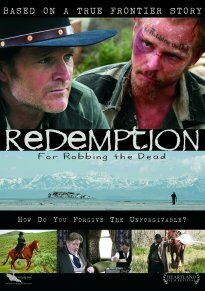 Because of my fascination with all things Salt Lake City Cemetery, as well as Utah's Mysteries and Urban Legends, I had to go see Redemption: For Robbing The Dead today. I dragged my hubby, my eight year old daughter, and my six year old son to see it with me. Before going, I told them a little bit about the story of Jean Baptiste, and how he dug up graves and stole their clothes. Knowing that the movie was about "How do you forgive somebody who has done the unforgivable," we talked about forgiving others and would you be able to forgive somebody that did something completely horrible and unthinkable to you. The movie's main character is Henry Heath, the sheriff in charge of Jean Baptiste. After Jean Baptiste was banished to Antelope Island, and then Fremont Island, in the Great Salt Lake, Henry Heath brought him food and water and checked in on him from time to time. This was a great movie about treating others with kindness, even those that have wronged us. Everybody is human and deserves to be heard and loved. It was a great story of forgiveness, no matter what the cost. I highly recommend it, as it was beautifully done with the help of many interns from the BYU Theatre and Media Arts Department. Follow the movie on facebook. It was a great center of conversation after seeing the movie, and when I asked my kids what they thought of it, my eight year old daughter said she "felt sorry for Jean Baptiste". She said she would have been mad if he had done that to her loved one that passed away, but she felt really sad for him and how he was treated. We also discussed that maybe he wasn't "all there" mentally, and maybe didn't understand that robbing graves was wrong? thanks for the kind words. Just a note that the film was made with the help of many interns from the BYU Theatre and Media Arts Department, not a BYU production.